Kriti Sanon at an event in Mumbai. 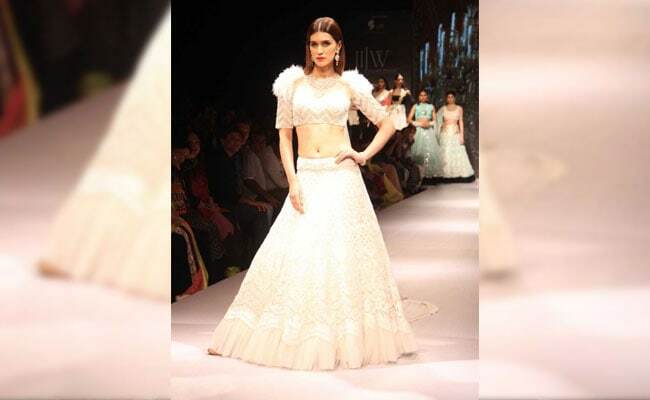 Model-turned-actress Kriti Sanon, who was last seen in Bareilly Ki Barfi, shared her first experience of walking the ramp, which was not pleasant. Sharing the incident, the 27-year-old actress said that during her ramp debut, she was so nervous that she mixed up the order and was scolded by the choreographer, reports news agency PTI. "I remember my first ramp walk clearly, because I had really messed it up. It was in Delhi, and I was walking in a lawn. It gets very difficult walking with heels because it sort of goes into the ground and it isn't very walk-friendly. It was my first walk, I was very nervous and I mixed up the order," PTI quoted Kriti Sanon as saying. The Raabta actress, who was present at an event on Thursday, also told PTI: "The choreographer was very rude and she blasted me in front of all the models. I didn't work with her post that. I remember sitting back in an auto and I was feeling so bad, I started crying a lot. I can never forget that." Kriti walked the ramp of the event on Thursday and said that coming back to a fashion event feels like home. "It's always nice to walk the ramp. You feel beautiful in the outfits you are wearing, you feel like you own the place. It is so fast, it gets over quickly, but it is a lot of fun," PTI quoted Kriti as saying. The turn at the head-ram for #Gili at #IIJW !! @nakshatraworld .. Thank you @archanakochharofficial for this stunning white piece!! Walked for the lovely @arpita__mehta yesterday at #LFW2017 !! Always feels so good to be back on ramp! Kriti recently returned from Dubai after holidaying with her parents. Kriti's pictures from Dubai gave us major family goals. #FamilyTime #Dubai @sanonrahul @geeta_sanon .. @nupursanon you were missed!! Kriti made her Bollywood debut with Sabbir Khan's Heropanti, co-starring Tiger Shroff, for which she also won the Filmfare Award for Best Female Debut. In the same year, she starred opposite superstar Mahesh Babu in her first Telugu film 1: Nenokkadine. She has also featured in Rohit Shetty's Dilwale, co-starring Shah Rukh Khan, Kajol and Varun Dhawan. Raabta, Kriti's first release of the year, featuring rumoured boyfriend Sushant Singh Rajput, tanked at the box office while she received a great response for Bareilly Ki Barfi, co-starring Ayushmann Khurrana and Rajkummar Rao.